U.S. AIR FORCE ACADEMY, Colo. — Staff Sgt. 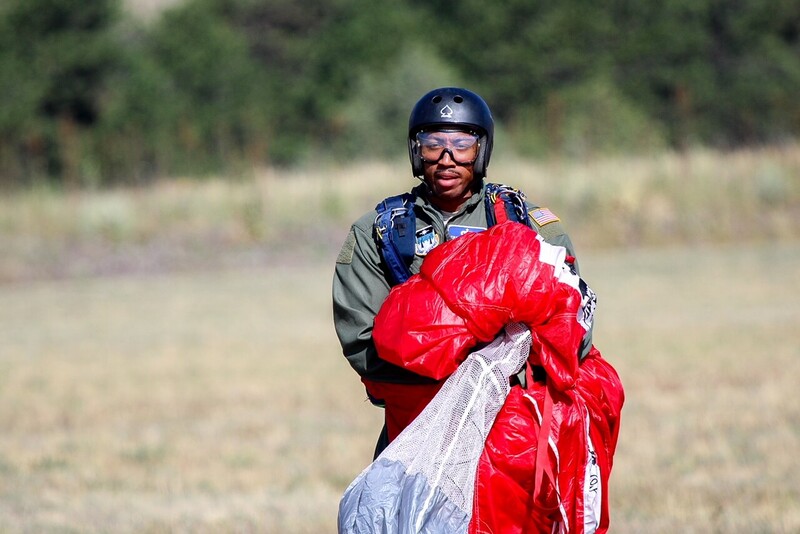 Charles Carter had to be the first passenger to jump out of that plane. “I knew I couldn’t be a leader if I wasn’t the first to jump so I jumped,” he said. Carter found himself standing in the door as the only noncommissioned officer in a group of cadets and cadet instructors on board the UV-18 Twin Otter aircraft flying 5,000 feet above Air Force Academy’s drop zone. Carter is a former security forces Airman from San Diego, who now serves as a protocol specialist at the Academy. 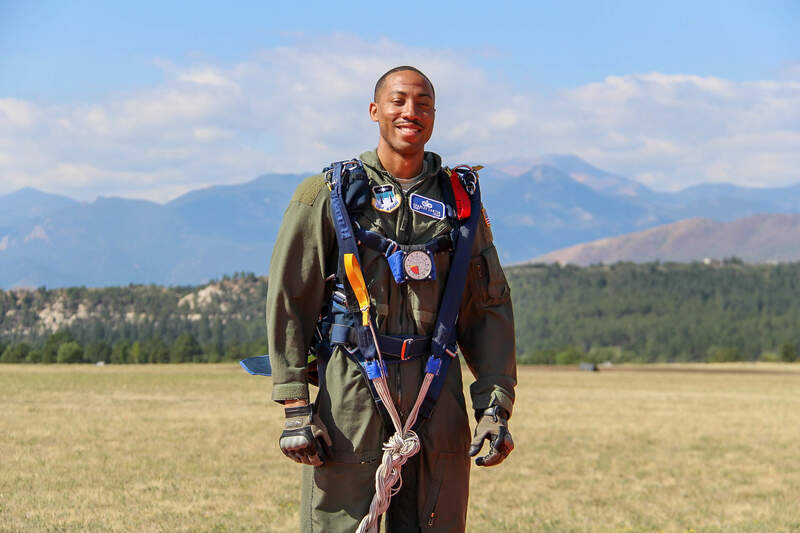 He was one of only a handful of permanent party service members to take advantage of the Academy’s summer session opportunity to sign up for Airmanship 490, a course that teaches cadets how to safely parachute. But Carter didn’t jump out of a plane right away. 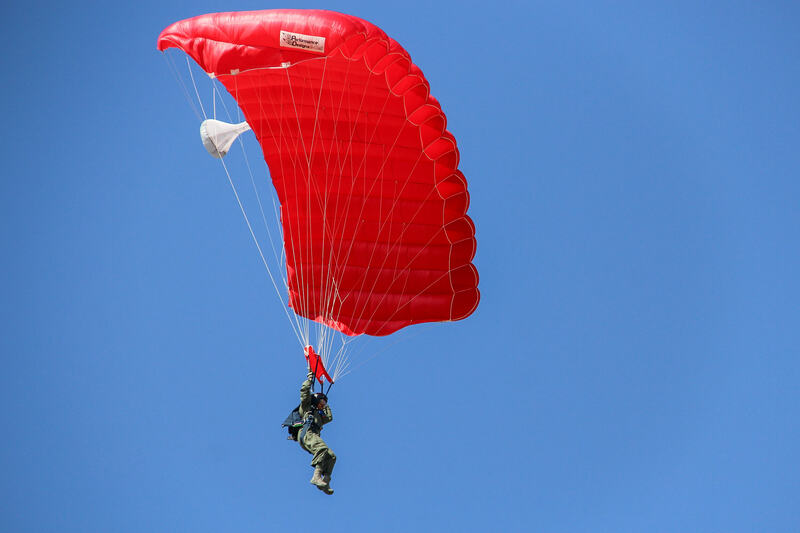 First, he completed nearly 40 hours of ground training, where he learned the ins and outs of parachuting – everything from when to pull the cord and properly land, to how to respond to in-air emergency situations. The AM490 course is intensive, and for good reason. It is the only known jump school where students perform their first jump all by themselves. No tandem. No instructor jumping with them. It’s just students, their parachutes, a one-way radio and their training. The AM490 staff tries to prepare students for what to expect once they do jump – telling them about how fast they’ll be falling, how loud the wind will be and teaching them which landmarks to look for – but the bulk of training is handled by cadets who have already completed the course. “This course puts someone in a very peculiar situation, essentially giving someone the knowledge and confidence to perform a very stress inducing activity that many others would never consider doing,” said Cadet 1st Class Jordan Rivera, an airmanship instructor for two years. In fact, the course is less about simply jumping out of an airplane and more about developing leadership traits. If someone can go up in a plane, step to the edge of the door and make the decision to jump, then they are exhibiting qualities necessary of good leaders – determination, inner strength and the ability to face and overcome fear. Now that he’s jumped out of a plane five times, a course requirement, Carter said he’s better prepared to face those fears. Cadet 1st Class Jordan Rivera worked closely with Carter throughout the course. He said he appreciates that staff members enroll as he believes it increases their leadership abilities and perspective. Rivera added that he enjoyed instructing an NCO with nearly nine years of service under his belt. Having successfully completed the airmanship course, Carter was awarded his jump wings – a small patch worn to show he is a qualified basic parachutist. “Earning the wings was a very intimate event for me,” Carter said. “After being deployed five times, I’ve never been pushed mentally, physically and emotionally like Airmanship 490 challenged me.